The short answer here is: no. But when it comes to convenience, we want more than just a short answer. Extension cords are built for convenience but also built for temporary use. The problem with extension cords is that they are not listed, labeled, or rated for long-term use. The Uniform Fire Code states that these types of cords are intended for the temporary and immediate use of an appliance and are not to be permanently “installed”. 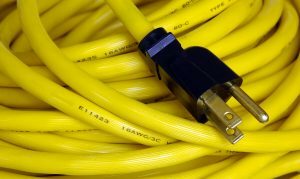 If you are constantly finding yourself relying on the use of extension cords, your best bet it to have an additional outlet installed where you need it the most. There may be another option for you if installing new outlets is out of the picture. Power strips with circuit breakers or breaker switches are approved for long-term use. Since these strips have built-in surge protectors, they are safe to use for longer periods of time. Again, there may be issues when it comes to using power strips — as with all devices. Even though the power strips intended for long-term use have built-in circuit breakers, overloading these devices can cause problems. If you plug in too many devices, especially device varying in power needs, you can find yourself facing a real problem. Overloading the wiring can cause fires. Be sure to inspect your power strips thoroughly to ensure you have the right one for your devices and keep multiple on hand to not overload one. It’s best to have a professional electrician come to your place to assess your situation. If you find yourself relying more and more on extension cords and power strips, it may be time to add some more outlets in your home or office. An electrician will be able to look at your set up and recommend the best course of action for you. The Electric Connection of Los Angeles has been providing homeowners and businesses alike with expert electrical services for over 35 Years. We’ve built a company of highly experienced, certified electricians to serve your electrical needs. There’s plenty of competition throughout Los Angeles, but we make it our policy to treat our customers the way we would want to be treated. That has gained us a great reputation. We’ll provide you with quality work at honest prices.